At the back of Frankensweet’s Candy Shoppe, under the last box of sour gumballs, there’s a trapdoor. Knock five times fast, hand over the bag of squirmy worms, and you can crawl inside The Monstore. The Monstore is the place to go for all of your monsterly needs. Which is perfect, since Zack definitely has a monsterly need. The problem? His pesky little sister, Gracie, who never pays attention to that “Keep Out” sign on Zack’s door—the one he has made especially for her. 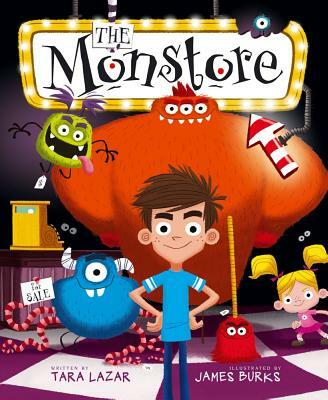 But when Zack’s monsters don’t exactly work as planned, he soon finds out that the Monstore has a few rules: No Refunds. No exchanges. No exceptions. Tara Lazar is the author of Monstore and I Thought This Was a Bear Book. Her mischievous imagination led her to write picture books, and she founded PiBoIdMo (Picture Book Idea Month). She lives in New Jersey with her husband and her two daughters. Visit TaraLazar.com for stories, giveaways, and contests for kids of all ages (like Tara!). James Burks started drawing as a little kid and hasn’t stopped since. Along the way he’s written and illustrated some books of his own, including Gabby and Gator, Beep and Bah, and Bird and Squirrel on the Run. The illustrator of Monstore, James lives in Southern California with his family.